A rare and reclusive leopard that hunts among the dense island forests of Borneo and Sumatra in south-east Asia has been identified as an entirely new species of great cat. 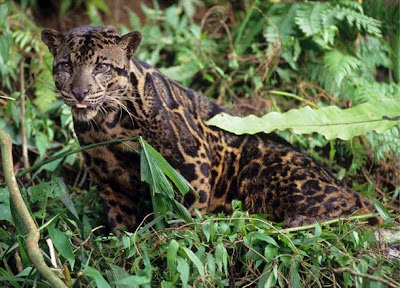 Genetic tests and pelt examinations have revealed that the animal, now called the Bornean clouded leopard (Neofelis diardi), is as distinct from other clouded leopards that roam mainland Asia as lions are from panthers. On the islands the clouded leopard is the top predator, preying on monkeys, deer, wild pigs and lizards, and has a crucial influence on the regional ecosystems. At their largest they reach just over 1m long, and for their size sport the largest canine teeth of the cat family. Their name comes from the mottled white patches that cover their skin. Clouded leopards were first described in 1821 by the British naturalist Edward Griffith, but few of the animals have ever been sighted and from the sparse information available scientists suspected they were either all one species, or possibly divided into four sub-species. By testing DNA from clouded leopard populations across Asia and the islands, scientists at the US National Cancer Institute in Maryland identified 40 genetic differences between the island cats and those found elsewhere, confirming them as two distinct species whose evolutionary paths divided 1.4m years ago. "Almost 200 years on we are just beginning to learn about these creatures," said Mark Wright, chief science adviser with the conservation group WWF-UK, which is working to protect the leopard's Borneo habitat from deforestation. There are estimated to be only 5,000 to 11,000 of the leopards on Borneo and 3,000 to 7,000 on Sumatra. The island species has small cloud markings, a double stripe down its back, and its grey fur is darker than the mainland species. The leopards are extremely agile and can hunt by staging ambushes from the trees. Little else is known about their behaviour. "These are big animals, but we know next to nothing about them and that's very telling. We meddle in the tropics at our peril, because we really don't know enough about what's going on there," said Dr Wright. "We know now these are two distinct species, so we have to direct conservation efforts at both the island and mainland populations." |: Hei-di, hei-da, hei-di, hei-da! "Morning you play differently; evening you play differently." the opening sequence of the Bond films. newspaper ads to "Go gay with Gaylord fine filter cigarettes". number so immeasurable, it defies all laws of calculus." Talao and Bandra still beg anonymity as they reminisce in sad whispers. "He was shameless. He left his wife and three small children for that girl." "Chris and Lorna were in love. When they fought, they became mortal enemies. He destroyed her and he destroyed himself." of one Hindu fellow who tried to get her to sing with him." "She hit the bottle, men. She became an alcoholic and just disappeared." filigrees, speaks its own truth. that kept the fans coming back night after night. were jolly people but they were afraid to laugh around Chris," Ronnie says. basic. "Bombay turned me around," he wrote. "I'd never seen poverty before." back to New York to pick up the latest music. for 20 years. "He was a character." drinks, he would continue one-handed. He had tremendous hands." subcontinent, where racial barriers seemed non-existent, at least for them. acknowledgement of his abstemious ways, helped Weatherford drill the band. withdraw it. All her savings were wiped out." while he slept, the trumpet would be on one side and mummy on the other." mealtimes and his bed at night." The altar was the centrepiece of the club. evening, members were required to gather around the altar to say the Rosary. The highlight of the year was the celebration in exile of the village feast. oratorio by Giacome Carissimi in seven voices at the Basilica of Bom Jesu. Goan ensemble playing in the Bombay Philharmonic Orchestra in the Town Hall. played at the weddings of the common folk and other festive occasions. have stayed in the picture ever since. would fall on one knee and raise his horn to the stars. They say Chic performed one of his greatest feats of improvisation offstage. down on the back of a matchbox. three extra rupees for dressing up in a white jacket and black trousers. of their lives at the margins of Indian society. accurate portrayal of the vital role Goans played the Hindi film industry. mere subcontractors, men whose main job was liaising with the financiers. director, salesmanship was more important than musicianship." at the camera in the best Satchmo tradition. take snatches of his background scores and work them into entire tunes,"
haltingly, you'd find a place there, on the back row," she says. crippling tax on establishments featuring live music kept patrons away. really frustrated. That's probably why so many of them became alcoholics." drink. Few actually cared to see the movies in which they'd performed. are unjustly imprisoned in the French version of Alcatraz for 14 years. temper was the stuff of popular lore. daughter for a walk along the sea". really? Was this amazing song in Konkani?" trumpets and modest recording quality." weddings, and is still sung before the toast is raised. nightingale's voice created the magic in rendering the songs effectively,"
Goa's legislative assembly. Remo, among others, has no doubts about this. have been no Chris," he has written. without him. Chris is said to enforced the bond in a muscular fashion. Emiliano. He's such a harmless bugger." sat him down and asked what he wanted. "I want to see Lorna," he explained. She replied, "That's me." Ronnie was taken aback. "She looked like a wreck. had hit the bottle and become total gone-case." had to be brought in. session. She was still afraid that Chris Perry would accost her. in, so he left a note. Ronnie intercepted the missive and didn't pass it on. voice. Let the sound linger in your ears, my friend. Hear my voice. The United States appears to have made a major intelligence blunder over North Korea's nuclear weapons programme, one that may have exacerbated tensions with Pyongyang over the past four years and goaded Kim Jong-Il into pressing ahead with last October's live nuclear test, intelligence and Bush administration officials have said. The blunder does not concern the plutonium-based bomb technology that North Korea used in its test and has clearly been developing for decades. Rather it concerns the assessment, in a Central Intelligence Agency report to Congress in November 2002, that North Korea was also pursuing a parallel uranium enrichment programme capable of providing the raw material for two or more nuclear weapons a year, starting "mid-decade". That prompted the US to cut off oil supplies to Pyongyang, to which North Korea responded by throwing out international weapons inspectors and ratcheting up its plutonium bomb programme. But now many intelligence officials doubt whether the North Koreans have a viable uranium enrichment programme, and administration officials have begun wondering if they could not have handled the North Korean crisis much more smartly if they had been in less of a hurry to get confrontational. On Tuesday, a veteran intelligence official called Joseph DeTrani told a Senate Armed Services Committee hearing that the government's certainty about the programme's existence was only at "the mid-confidence level", agency-speak meaning the information is not fully corroborated and some officials hold other views. On Wednesday, the Director of National Intelligence declassified a report on North Korea which stated: "The degree of progress towards producing enriched uranium remains unknown." Non-government weapons experts including David Kay and David Albright - both veterans of the Iraq intelligence fiasco - see such statements as the beginning of a full retraction and an admission that the CIA and other agencies jumped to conclusions based on insufficient evidence. "The evidence doesn't support the extrapolation," Mr Albright, now president of the private Institute for Science and International Security in Washington, told The New York Times. "The extrapolation went too far." The extrapolation was based, principally, on seemingly solid evidence that North Korea obtained about 20 centrifuges for the production of enriched uranium from Abdul Qadeer Khan, the "father" of Pakistan's atom bomb, in 2000. When it transpired that North Korea was also buying aluminium tubes - not unlike the aluminium tubes so widely mentioned in connection with Iraq's (non-existent) nuclear programme - the CIA and the Bush administration saw a "smoking gun" that convinced them the enriched uranium programme was up and running. Mr Albright said the aluminium tubes were relatively weak and were not suitable for mass-producing centrifuges for a bomb programme as the US government suspected. The tubes the North Koreans bought were "very easy to get and not controlled" by global export agencies because they were regarded as largely harmless. So the best assessment now seems to be that the North Koreans were stalled in their ambitions for lack of raw materials. "The administration appears to have made a very costly decision that has resulted in a fourfold increase in the nuclear weapons of North Korea," Senator Jack Reed of Rhode Island, a members of the Armed Services Committee, said. "If that was based in part on mixing up North Korea's ambitions with their accomplishments, it's important." The apparent blunder is likely to renew questions about the reliability and the political slanting of US intelligence that emerged after the 2003 invasion of Iraq, and the failure to find any sort of biological, chemical and nuclear weapons programmes the Bush administration talked about in justifying its pre-emptive war. A similar debate about weapons intelligence and politics is raging over Iran, as the Bush administration ratchets up its rhetoric against Tehran, and the Democrat-controlled Congress worries that he is planning another war in the Middle East. The North Korean case is different, not least because it is the administration itself which seems to be doing the back-pedalling. That may be linked to North Korea's agreement to readmit weapons inspectors. The Bush administration may prefer to sow doubts about its assessments now rather than face greater embarrassment later. Scientists have discovered the oldest solar observatory in the Americas and, in the process, may have solved a centuries-old puzzle about the purpose of an ancient stone fort on a remote hilltop in Peru. The researchers have shown that an enigmatic wall of 13 stone towers within the Chankillo complex, a 2,300-year-old ruin nearly 250 miles north of Lima, worked as a solar calendar to monitor the winter and summer solstices. They believe that the solar observatory proves the existence of a sophisticated Sun cult in the region more than 1,000 years before the Inca civilisation built its famous Sun temple in the Peruvian mountain city of Cusco, prior to the Spanish conquest. Ivan Ghezzi of the Pontificia Universiadad Catolica del Peru in Lima and Clive Ruggles of Leicester University have found that the line of 13 towers at Chankillo can be used to precisely observe the Sun as it rises and sets at different positions along the horizon throughout the year. Historical accounts suggest that the Inca Sun pillars at Cusco - which have vanished without trace - were used until the 16th century AD to mark planting times of crops and to observe seasonal ceremonies, Ghezzi and Ruggles say in their study published today in the journal Science. They believe that the discovery means that the massive Chankillo complex - dated to the 4th century BC - must have played an important role in the ceremonial rituals associated with the annual cycles of the Sun. Archaeologists have puzzled over the purpose of Chankillo since it was first discovered in the 19th century. They suggested it may have been used as a fort, a temple or even a setting for ceremonial battles. One of the biggest mysteries of Chankillo was the purpose of a low ridge composed of 16 relatively small stone towers which together formed an artificial toothed horizon for no apparent reason. However, Ghezzi and Ruggles show that the gaps formed between the towers match the annual rising and setting arcs of the Sun while it dips below the horizon during the winter and summer solstices. The line of towers, which range in height from about 6ft to 20ft, were built along a north-south axis and can be viewed full-on from two other stone positions, one to the east and one to the west of the ridge. "Viewed from the two observing points, the spread of the towers along the horizon corresponds very closely to the range of movement of the rising and setting positions of the sun over the year," say Ghezzi and Ruggles in their study. "This in itself argues strongly that the towers were used for solar observation," they say. In their study, the scientists demonstrated that the setting sun at the winter solstice can be viewed from the eastern observation point as it falls to the left side of the southernmost tower. Meanwhile, from the western observing point, the same midwinter sun the following morning could be viewed rising from the last tower on the right of the observer. During the course of the year, the setting and rising sun moves through the different "teeth" of the artificial horizon until finally it reaches its next furthermost point at the summer solstice in June - when it can be observed rising and setting beyond the last tower to the north. "The towers are relatively well preserved; their corners have mostly collapsed, but enough of the original architecture survives to allow a reconstruction," the researchers say. The towers are regularly spaced and each has a pair of stone staircases leading up to the summit, one on the north and one on the south side. "Most of the tower summits are well preserved; no artifacts remain on these surfaces, though it is clear from the staircases that the summits were the foci of activity," they say. Archaeologists have found evidence to suggest that the ceremonial practices took place at the two observing positions. The western point has offerings of pottery, shells and lithic artifacts whereas the eastern site was probably a site of ceremonial feasting, the scientists said. The gaps between the towers may have been used to mark out the days of a solar calendar. For instance, the sunrises between the gaps in the central towers are separated by a time interval of 10 days, implying that a 10-day "week" may have been important in the solar calendar. "Once the Sun had begun to move appreciably away from either of its extreme positions a few days after each solstice, the various towers and gaps would have provided a means to track the progress of the Sun up and down the horizon to within an accuracy of two or three days," say Ghezzi and Ruggles in their research.